You know how they say that when it rains, it pours? That's my life right now. In addition to the sick family member and family stress mentioned in my previous post, I've been dealing with bronchitis, and there has been a death in the extended family. Since I didn't have any samples that needed to be swatched, I took a break. I'm going to try to ease back into things with some quickie posts. Dollish Polish has started doing monthly Limited Edition polishes, and Sugar Plum Fairy is November's LE! 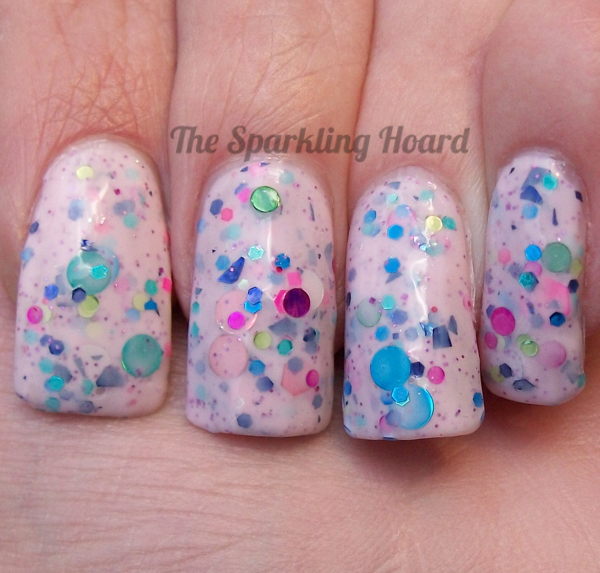 This polish features a pale pink crelly base filled with brightly colored circle, hexagonal, shredded, and star glitter. I haven't actually seen any star glitter in my bottle, but I hear that it exists. If you're extraordinarily girly and love bright and playful polishes, this one should be right up your alley! Formula was fine and dry time was average. 2-3 coats are needed to reach full opacity. Sugar Plum Fairy is only available while supplies last, so if you want it, grab it now. This polish costs $10 for 15mL and can be purchased from the Dollish Polish website. To stay up-to-date on the latest collections and monthly LEs from Dollish Polish, Like the brand's Facebook page. I really want to like this one, truly I do. The glitter is perfect and gorgeous, I just can't get over the base color. It's just slightly incongruous and makes the polish really not work for me, which is a shame because I love the glitter combo so much. It's a very nice swatch, though!